DVD Photo Slideshow allows you to make use of your DVD or CD burner to create entertaining slideshows you can watch on TV. With one click, DVD Photo Slideshow creates an exciting photo slide show with music, motion menus and transition effects. With DVD Photo Slideshow you can quickly and easily produce professional-looking photo slideshow DVD disc and share the slide show on home big screen TV with standard DVD player in the comfort of your living room. Within a few minutes of work, you'll have an eye-catching slide show on CD-R or DVD-R disc that will run on nearly any DVD players connected to TV. Download a free trial version and show your photos on TV! Get full version for only $49.95! With DVD Photo Slideshow, thousands of pictures from holidays, landscapes, wedding or family parties can now be enjoyed on TV as high resolution DVD slide show. The program’s simplified three-step workflow enables users of all levels to build custom slide shows, design on-screen menus, and burn discs for sharing at home, and sending to friends or customers. DVD Photo Slideshow gives photography lovers or photo collectors a new and easy way to view, store and share their pictures from digital camera, scanner or Internet. With just a few clicks, you can use DVD Photo Slideshow to view and edit photo, create and organize your photo album, add background music, burn your photo album on blank DVD+R/RW, DVD-R/RW, CD-R or CD-RW disc. 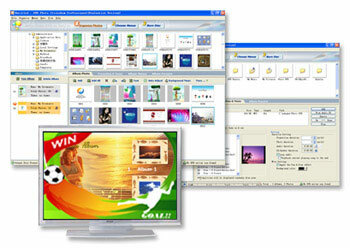 After that, you can show your creative works on TV through a DVD or VCD player. DVD Photo Slide Show can also archive your original photo files in DVD or CD disc so that you can print or process them in the future. Click here to start making photo slide show on DVD disc and show slidehow on TV. With this photo program, you can easily archive hundreds of your favorite high-resolution photo into a DVD or CD disc that is accessible by your PC. You can share your archived DVD or CD discs with friends, family, clients or colleagues! For more information about how to make photo DVD or VCD with DVD Photo Slideshow, please visit this helpful 1,2,3 How-To for our amazing software.